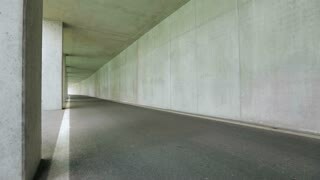 A young woman in casual clothes travels by bicycle on an asphalt road in a tunnel. Beautiful young woman in casual summer clothing walking and holding handlebars of bicycle with wicker basket and looking away. Confident young girl in casual clothing posing in park standing with bicycle and talking phone while smiling away.